Working in an exclusive collaboration with Fike, the market leader in explosion protection, we have designed and built some large 1x1.2m explosion isolation valves that have been tested and certified by Ineris for Atex certification as a protective device to 0.5 bar. The valves are used as part of an explosion detection, suppression and isolation system and the certification tests covered the whole detection and suppression system as a certified protective device. The system detects an explosion and flame, and instructs the valve actuator to slam the valve shut. While this is happening, the system also releases suppressant into the area below the valve to prevent flames from passing the valve while it is closing. With the valve shut, the flame was successfully extinguished by the valve itself without the use of further suppressant. Even after repeated testing, the valve was still useable and once stripped, cleaned and repainted, was fit for use on the live system handling wood pellet for the Drax Power reception and storage facility at Immingham. 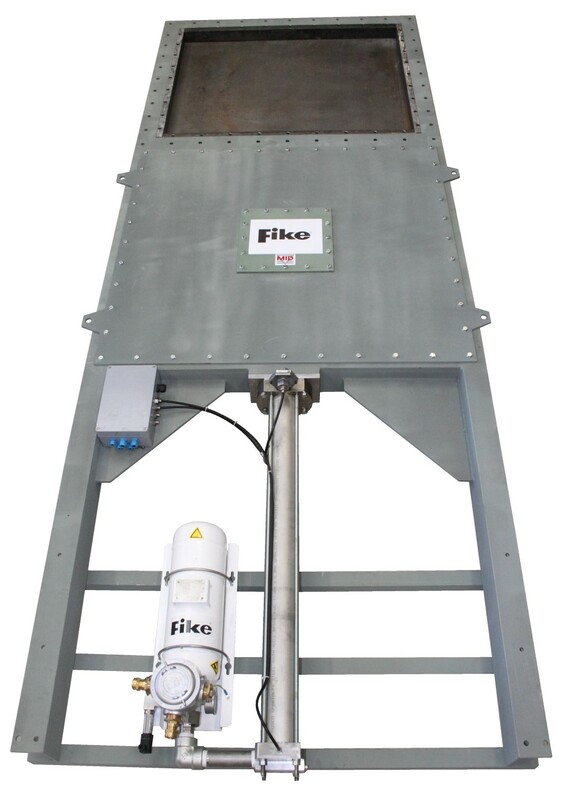 Fike and MID are the only people currently able to supply certified explosion protection systems at this size for projects handling potentially explosive products.